When we discuss about process automation in terms of Protocols, many names in our mind. Digital protocols are HART,Fieldbus, and PROFIBUS PA.However,you can find use integrate a field device to a control system that may suit your application. Today we’ll discuss about DeviceNet, A low-level application-layer protocol for industrial application. In DeviceNet network You can connect up to 64 nodes. 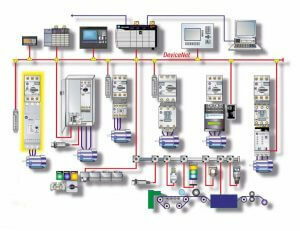 Each node can contain simple sensors or process related instrument or programmable logic controller (PLC). DeviceNet Follow Controller Area Network (CAN) standard,devices to communicate with each other. Automation created DeviceNet as an application layer protocol based on this standard. DeviceNet mostly uses a trunkline-dropline topology, where small lines connect devices.and small line connect with main line. These small lines should not run more than six meters from the trunkline. Using Devicenet Cable you can supply Power to many device that depending on how much power device needs. 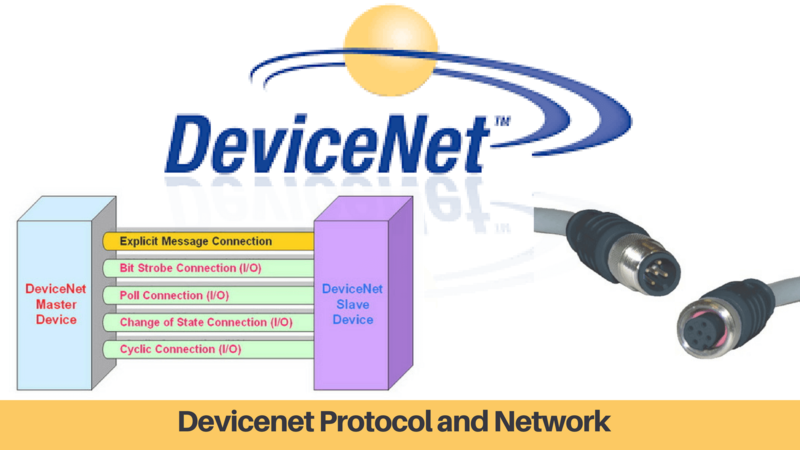 DeviceNet follow common industrial protocol (CIP) for its upper layers. The CIP follows the open systems interconnection (OSI) model in seven layers: 1.physical, 2.data link, 3.network, 4.transport, 5.session,6.presentation,7.application. So length of network depend upon your network speed and type of cable you use. A device’s EDS file will give you all the relevant information you need on the device. DeviceNet works the same way. Vendors must provide the proper files for their devices that use DeviceNet as their protocol. Often you’ll have to download this file from a vendor’s website, then upload it to your system. Configure Devicenet is a Art!!!! The way you configure your DeviceNet devices can vary by factors such as the type of control system you have.However,we can give you an overview to point you in the right direction. When you purchase a device for DeviceNet, it should have a MAC ID.After you set up the device, you also have to set the network where you plan to install it. You’ll need other data such as the class identifier, instance identifier, and attribute identifier as well. After that, go to your control system and add the DeviceNet scanner. Then the software will browse the network, find all devices connected to the driver, and so on. The Following link describes the codes. Numeric display shown by flashing the code and the node number alternately. If many codes and node numbers must be shown, the display cycles through them in node number order. Abnormal conditions caused by user action. Blue shows abnormal or error conditions. Red shows severe errors, possibly requiring a replacement scanner. Bold codes show the most common conditions. You can also collect more data with your DeviceNet analyzer tools or multimeter, like shield voltage, voltage differential between recessive and dominant, and so on.